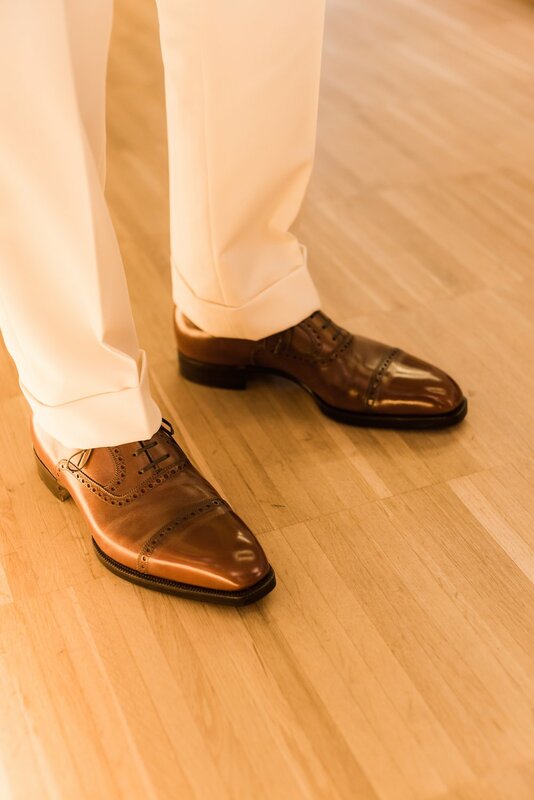 After two and a half years I finally received my first Stefano Bemer bespoke shoes last month. And what beauties they are. I was initially measured by Stefano, who also oversaw the creation of my last. But it wasn’t until earlier this year that I had a fitting, due to Stefano’s unfortunate passing and the following disruption to the company. I’m glad to say that hasn’t in any way affected the quality of the output, largely due to the same staff (particularly Masako) being involved in their construction. These are the best-fitting first pair of bespoke shoes I have ever had from a maker. My best fitting overall are probably the Gaziano & Girling Adelaides, but that was a second pair on a new, refined last made by Daniel. Hard as it is for anyone saving up for their first pair of bespoke, the second pair is inevitably better than the first. It was the same with Cleverley and doubtless it will be the same with Bemer. For while they are the best fit of any first commission, there are couple of small things Masako and I will probably refine. There is a bit too much space across the joints, for example, and the instep should also probably be cut a little shallower. But please understand: these are tiny imperfections. The shoe is an absolutely superb fit, better than every RTW shoe I have worn by some distance, and better than all bespoke but one. The foot is supported beautifully through the arch; the precise, high shape of the heel cup means that the foot is held solidly, even without lacing the shoe; and the toes have freedom to move even within the lovely, chiselled last. As to style, this is a classic Bemer shape – relatively wide in the points, but coming into a short, sharp toe. The toe cap is elongated, which lends further prominence to that area of the shoe. The only downside of this design is that the toe puff (the reinforcing layer of leather inside the toe) is not as long as the cap, leading to wrinkling on either side of the line of brouging. I can see some people disliking this, but I don’t mind it. The sole is thicker than most, which is also typical of Bemer. I like it on tan shoes like this, though might have specified something thinner on an office shoe. Bemer are also not great yet at adding colour variation to the upper – whether through burnishing, polish or dyes. This is changing, but means that there is some reliance on polishing in some subtly different colours (something I have already started on with gusto). Having said that, the quality of the leather is superb – only Gaziano & Girling and EG Top Drawer shoes take a polish so well. Prices: €2250 for bespoke, €850 RTW, both ex-VAT. 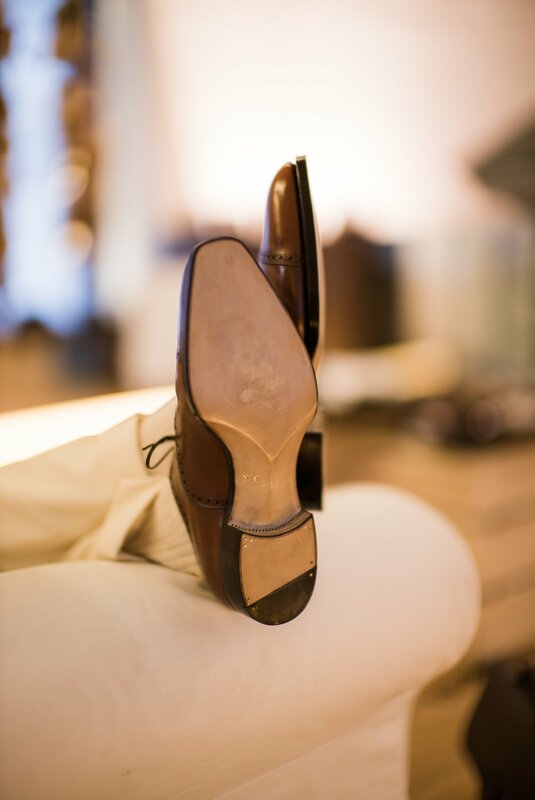 You can follow the discussion on Stefano Bemer: final bespoke shoes by entering your email address in the box below. You will then receive an email every time a new comment is added. These will also contain a link to a page where you can stop the alerts, and remove all of your related data from the site. Can you please let mpus know about the trousers? Who made them, what kind of metrical etc? Would you say there is a big difference between buying a slim fit polo and a a relaxed fit one from John Smedley if you size down on the one with relaxed fit? I am still looking for a good polo for fall and the dartmoor v3 does not seem to be close. Altso; keep up the good work. I read every single post. Congratulations Simon, what a beautifully balanced and proportioned pair of shoes. They exude class and style. Sad circumstances notwithstanding, what may I ask is a normal lead time for this firm? They look great! As you say, a little more colour variation ( I don’t like a great deal myself) and they are going to be stunning. If I had the cash spare I’d be off to get measured up, better get saving! Very nice shoes Simon! I wonder if this is a favourite style as they’re very similar to your Adelaides. Were you tempted to go for a full or half brogue? I like the cream pants you are wearing, how much did it cost you? Thanks for including the video. The pictures are beautiful, but in action the shoes really exceed expectations. Trolling through your archives, and came across your Poole Prince of Wales 4×2 DB. I used to be against the 4×2, thinking the absence of the two buttons was strange and overly casual. But your suit has me thinking! Did you ever add the extra two buttons? How often do you think you’ll wear these? Do you prefer them to the G&Gs? Maybe these are slightly less formal? It’s marginal. The G&Gs are a slightly better fit, as I said, but then they were the second pair from them. Simon they are superb shoes. I found a post by you in another blog where you mention that you wanted to try the unconventional, non-bespoke, fitting approach from St. Crispin’s (e.g. customized last, personal last, trial shoes, etc). Did you ever try it? Can you share your thoughts? Not yet, no. I still hope to though! Hi Simon, isn’t a hand-stitched sole vulnerable to water ingress? If so is this an issue in practice? Simon, huge fan. I am reading their website and realised that there are currently 2 different levels of Bespoke. €2,000 for blue and €3000 for sixpence. Are you in the position to elaborate on the difference of both? Thanks Simon. Considering the fit is the most important aspect of Bespoke – I will go for the blue first. I have continued to love these since first seeing them on this post. I wondered, are these your favourite pair of shoes Simon? They are very nice, but I’d hesitate to say any single pair is my favourite – so many of them are different styles, which I like in different ways. 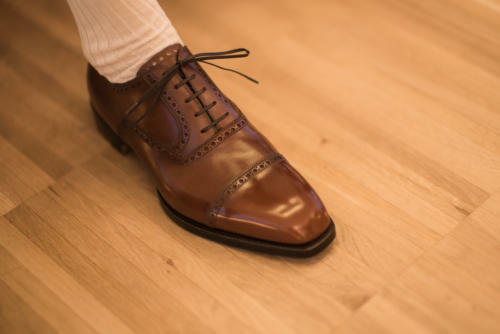 I’d also say that of my Stefano Bemer shoes, the second pair I had made (tobacco suede here) are probably my favourite as we refined the fit and it’s now perfect.